Little Farm in the Foothills: International Fairy Day and a Free Fairy eBook! Another woman at the festival saw my fairy book and started talking about a fairy movie she’d seen. “You mean, that documentary where they interview people who’ve seen fairies?” I asked. Her face lit up. “That’s it!” We started chatting about the film, The Fairy Faith, which is about real children seeing fairies in the woods. But as these kids grow up, most of them stop seeing the fairies, or forget they ever did. Another year or two went by. While that beautiful fairy tree image sat neglected on my computer, I was working on other books. Then one fall day, I heard the buzz of chain saws, and the grinding of excavators. Loggers had moved into the deep woods near our home. Before long, the tract of deep green woodlands about a third of a mile away was reduced to an unsightly snarl of dead trees and brush. Talking with other folks living close by, John and I found we’d all seen more wildlife out in the open since the forest came down: Owls, bear, even a mountain lion or two, and I’d recently laid eyes on the first skunk I’d ever seen here in the Foothills. I realized what happens when you take down a forest—the wild creatures must find new homes. As Christmas approached, John and I watched another wonderful film, Fairy Tale: A True Story. (This movie is billed as fiction, but you never know…) Within days, my fairy story came together. I asked myself, “What if?” What if a band of woodland fairies live in a forest, and the trees get cut down? This International Fairy Day, you can find out what happens…for free! 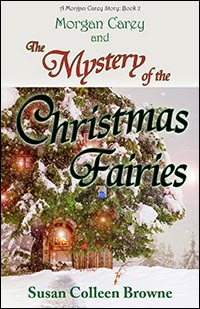 Morgan Carey and The Mystery of the Christmas Fairies will be a free ebook starting Wednesday, June 22 though the official Fairy Day, Friday, June 24. I hope you’ll take a look…and if you get a chance, share your fairy tales here!